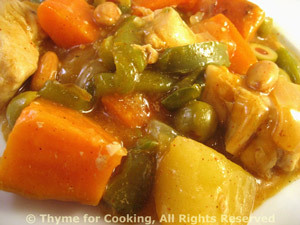 Moroccan Chicken Stew, Thyme for Cooking's Healthy Weekly Menu. This is a simple stew with the flavors of North Africa.... 15 minutes to get together, then 30 to simmer. This is a simple tagine, or stew with the flavors of a North African souk. Add harissa or other hot sauce to taste. If you can't find a small - medium sweet potato, skip the white potato and use 1 large sweet potato. Cut chicken into 2" (4cm) pieces. Cut carrot and pepper into sticks. Cut white and sweet potato into large chunks. Heat oil in large saucepan over medium-high heat. Add paprika, cumin, cinnamon, onion, pepper, carrot and sauté until onion is tender, about 7 minutes. Add garlic, ginger, chicken and lightly brown. Add chicken stock, both potatoes, cover and simmer until vegetables are done, 25 - 30 minutes. Pierce vegetables with a fork or sharp knife to check. Uncover saucepan, increase heat and add cornstarch, stirring until sauce is thickened. Stir in olives, almonds and serve.